Jump N’ Slide, the newest entertainment destination for kids and families, is NOW OPEN in Newton, just outside of Boston! Jump N’ Slide is the perfect venue for a child’s birthday party or a group play date and caters to children of all ages, toddlers through teens! JUMP HALL is the largest of the various fun-filled spaces at Jump N’ Slide; it features an oversized bounce castle, a bouncey obstacle course, and an inflatable competition mountain. In addition to bouncing, climbing and sliding – kids can grab a pair of safety goggles and practice their aim at the Cannonball Shooting Range; the goal is to hit your target with a supply of squishy, soft balls. 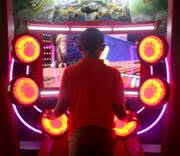 The ARCADES CASTLE is home to a combination of nearly a dozen classic and modern arcade games such as air hockey, skee-ball, Pac Man, Whack N Win, as well as a Jump N’ Slide snack bar. There is a build-a-bear style activity room for designing and creating stuffed animals, a Golden Rush room where kids can sift through sand in search of golden nuggets inside a mine, and the ultimate test: the Laser Maze! The MAGIC-5 KINGDOM is a special room for children under five years of age. Inside the Princess Castle, young ones can play dress up with the closet of princess gowns; in the neighboring Lego Room, kids can challenge themselves with endless building options! 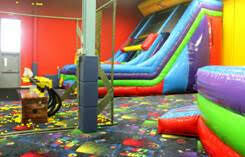 There are ride-on toys, climbable options and a bounce house with slide and a ball pit suitable for the younger kids. An additional room is available inside the Magic-5 Kingdom for young ones’ birthday parties and snack times. Pre-priced birthday party packages are available at three different levels starting at $399 that offers lots of fun and parents can leave the planning and cleanup to us! Each birthday party is overseen by a Party Host, who helps lead groups enthusiastically through their scheduled party experience. The walk in fee is $15 and includes unlimited time in the Jump Hall as well as $3 towards arcade game cards. Jump N’ Slide is located at 145 Wells Avenue #2 in Newton, MA 02459 and is open Fridays from 4pm-9pm, and Saturdays and Sundays from 9am-9pm. Free parking is available on site. For more information or to book a party, please visit: www.jumpandslideboston.com or call (617) 969-JUMP. About Jump N’ Slide– Jump N’ Slide is a family entertainment center located in Newton, MA committed to providing safe, fun, relaxing and affordable entertainment to the local community within the greater Boston area through superior customer service and exciting entertainment venues. For more information, please visit www.jumpandslideboston.com.